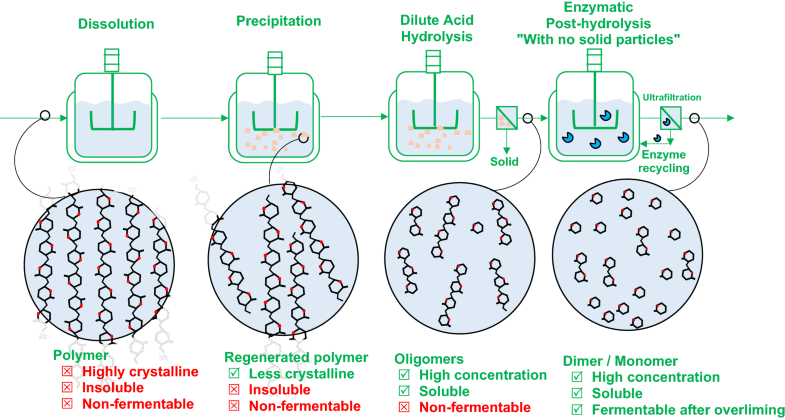 A process consisting of regeneration of crystalline cellulose, dilute-phosphoric acid hydrolysis of regenerated cellulose to soluble oligomers, and enzymatic post-hydrolysis of soluble oligomers in the absence of disturbing solid particles was evaluated as a process alternative for upgrading the obtainable sugar concentration and facilitating the long-term enzymatic hydrolysis of cellulose by utilizing soluble oligomers instead of insoluble particles. 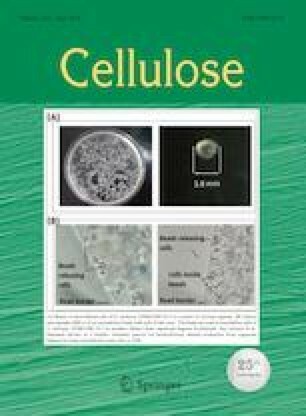 Cellulose was regenerated though phosphoric acid-acetone process, i.e., dissolution into 21 g/g acid at 50 °C for 60 min and precipitation by adding 41 g/g acetone. Regenerated cellulose was hydrolyzed at 120, 150 or 180 °C for 30 or 60 min using 0.5 or 1% phosphoric acid. After filtration, the hydrolysates were subjected to 10 or 15 FPU/g cellulase. Dilute-acid hydrolysis of regenerated cellulose with 0.5% acid at 180 °C, 30 min, and 10% solid loading resulted in an “oligomeric hydrolysate” with 44.6 g/L soluble oligomers. Enzymatic post-hydrolysis of soluble oligomers resulted in a “monomeric hydrolysate” containing as high as 47 g/L glucose and cellobiose. In the hydrolysis, 429 g sugar was released at high concentration from one kg crystalline cellulose. The hydrolysates were subjected to fermentation by Clostridium acetobutylicum, where oligomeric hydrolysates showed poor fermentability. The fermentation of monomeric hydrolysates obtained by dilute-acid hydrolysis (120 °C, 60 min, and 0.5% acid) and post-hydrolysis (15 filter paper unit/g) resulted in 6.1 g/L acetone–butanol–ethanol. Besides other potential advantages, this hydrolysis approach resulted in relatively high concentration of glucose which may facilitate cellulosic butanol production.